Director Steven Spielberg received a lifetime achievement honour at the David di Donatello awards - Italy's version of the Oscars - on Wednesday. But the ceremony was overshadowed by news that an Italian hostage had been killed in Iraq. Spielberg said he was "a very strong supporter of the soldiers risking their lives in Iraq right now". "But I am a film-maker that dreams for a living," he said. "But I don't have a lot of happy dreams any more." 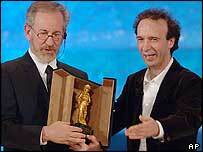 "A lot of my dreams have tears in their eyes," he said as actor Roberto Benigni gave him his award. News of the death of 36-year-old hostage Fabrizio Quattrocchi came through while Wednesday's ceremony was taking place. State TV station Rai-uno interrupted its coverage of the event before most of the main awards were handed out to cover the breaking news from Iraq. Spielberg, 57, told the audience: "I feel that this war was not a war of necessity but a war of choice, and that's what makes me sad." The Schindler's List director went on to say Italian cinema had a great influence on his life. Earlier on Wednesday, Spielberg was awarded the Cavaliere di Gran Croce - Italy's highest decoration - for his work in preserving the history of the Holocaust through film and documentary. Italian president Carlo Azeglio Ciampi called him "a master of film-making and of the worldwide industry of dreams and realities". The big winner at the Donatello awards was The Best of Youth (La Meglio Gioventu). The six-hour epic about recent Italian history won six awards, including best film, director and screenplay. Penelope Cruz was named best actress for her performance in Don't Move (Non Ti Muovere). Cruz's co-star, Sergio Castellito, won best actor, while French-Canadian drama The Barbarian Invasions - named best foreign language film at this year's Oscars - won best foreign film. It was a bad night though for front-runner Che Ne Sara Di Noi (What Will Become Of Us?). Giovanni Veronesi's coming-of-age film walked away empty-handed, despite being up for 12 awards.